Maâlem Houssam Guinia is the son and successor of the late Maâlem Mahmoud Guinia, an emblematic figure in the practice of West-African Gnawa music. Maâlem means 'master musician', and the tradition of Gnawa is inherited by family and passed down from generation to generation. Gnawa is an extensive treasury of ceremonial folk, poetry and dancing. The deeply hypnotic, repetitive rhythms are said to have spiritual and healing powers. This is why the music was originally used as a supportive element at ceremonies ('lila'), where participants are able to enter a state of trance. The foundation of these distinctive sounds is laid by the ‘guembri’ instrument. This a three stringed, skin-covered bass plucked lute, used in Morocco and surrounding countries, and played by Houssam Guinia as well. Gnawa stems from an ethnic minority; people whose ancestors were slaves in various West African countries and had to adapt to the Moroccan culture. Music was their way to maintain the traditions of their ancestors. This is music of forced hardship and loss of home through violent means, marginalization and the difficulties of integration into a new society. In recent years, Gnawa has become more widespread and is taken from traditional ceremonies onto the stage. Mahmoud Guinia played a key role in this, as het collaborated with many international artist, including jazz mastermind Pharoah Sanders. Father and son Guinia both also have collaborated with James Holden, one of this year’s curators at Le Guess Who?. In 2014, he traveled to Marrakesh to collaborate with Mahmoud and Houssam Guinia for a week long residency. Holden was enthralled by the rhythms of the band and wanted "to understand how we do rhythm and how it works with us". During their sessions, he had to move fast to create and emulate the distinctive Gnawa beat via a homemade drum machine patch on his modular synth. The results are unique, trance evoking recordings that combine the melody of the guembri with Holden's electronic sounds in a spirited cultural exchange. As a result of their time spent working together, the EP 'Marhaba' was released. One year later, Mahmoud Guinia passed away. In 2016, Holden shared the stage with Houssam at Rewire Festival in The Hague for an enthralling performance that imbued traditional and futuristic elements. 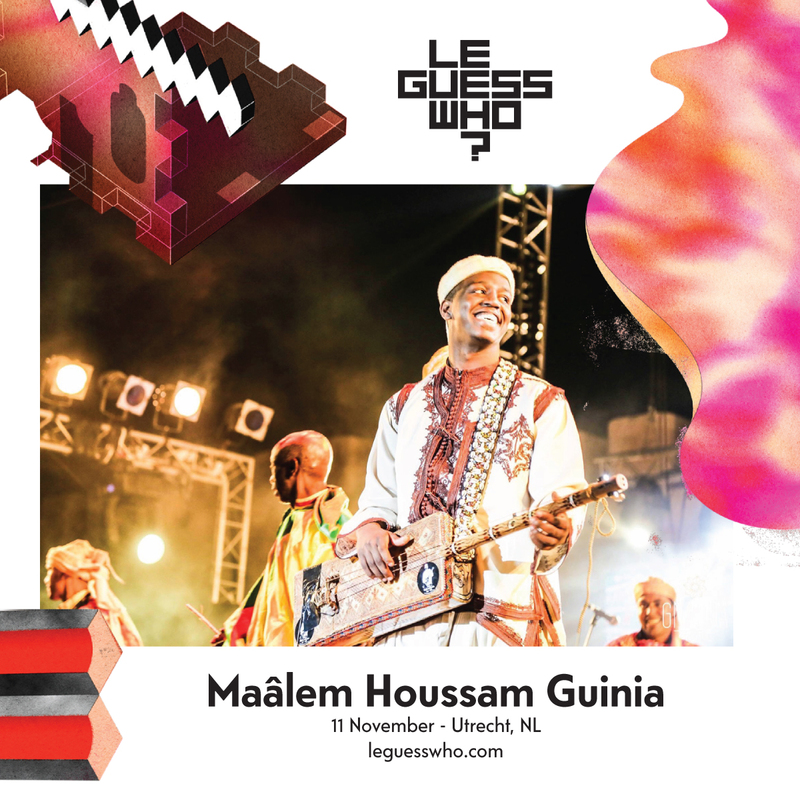 Now James Holden invites Maâlem Houssam Guinia to Utrecht for his curated program at Le Guess Who?. Houssam seeks to maintain the legend of his father, and to continue the intercultural adventure that he started.